Google cybernetic dolphins: Can technology create human-dolphin communication? What’s going on in that adorable little head? This was the heady cocktail served up last week by Alexis Madrigal over at the Atlantic. After finding the phrase “cybernetic dolphins” buried in a New Yorker article about Google’s self-driving cars, and noticing that Google’s director of engineering, Ray Kurzweil, had an interest in dolphin communication, Madrigal got on the horn to Google X. Were they, by chance, working on a secret project to facilitate two-way communication with dolphins? The answer was a rather disappointing “no,” causing dolphin researchers everywhere—including me—to deflate with disappointment. How awesome would it have been to have Google pouring money and expertise into a dolphin communication research project? Madrigal did discover a fragile Google-dolphin link, however. One of the developers of Google Glass—Thad Starner—is working on a project together with dolphin scientist Denise Herzing of the Wild Dolphin Project. But this research project is part of Starner’s work at Georgia Tech, and wholly unaffiliated with Google. This little emotional rollercoaster got me thinking though. What would happen if a tech giant like Google got in on the game, throwing unlimited resources at the problem of deciphering dolphin vocalizations or establishing inter-species communication? Imagine if you will a room populated by the most innovative minds of our time, from Google and beyond. Thought leaders like Kurzweil, Bill Gates, and Richard Branson. Let’s throw the ghost of Steve Jobs in there for good measure. If we gave them the task of assembling a team of engineers to develop a device that could record dolphin vocalizations and spit out a translation into English, could they do it? The answer might well be “no.” Not due to technological limitations, but to the limits of animal communication itself. If it turns out that dolphin communication lacks labels for concepts (i.e., words), then there is nothing there to decode in the first place. Human language is fundamentally based on a label system, but animals, for the most part, don’t use their communication systems that way. Instead, they mostly produce sounds that represent their emotions or occasionally their intentions—much like humans do when we laugh, cry, or scream. We don’t need a room full of geniuses to decipher these kinds of animal signals, which are very limited in terms of “meaning.” I tackle this sticky subject at length in my new book, Are Dolphins Really Smart? If, however, dolphin communication is riddled with labels, buried within a linguistic system that in no way resembles human language, then we’ll darn well need a genius think-tank to help us decipher it. Up to now, our biggest and brightest minds have not discovered anything in dolphin communication that smacks of language. Dolphin signature whistles—which function a bit like names—are the only label-like thing that scientists have found in dolphin communication. When the Soviets and the folks at SETI got in on the game of trying to decipher dolphin communication using information theory a few decades ago, the conclusion was that dolphins’ signals do indeed carry a fair amount of information. But whether or not their signals had “meaning” in the language/label/word sense, well … no software will be able to tell us that. What if, instead of trying to decode dolphin communication, we asked the Gates-Kurzweil- Branson-Jobs genius consortium to develop a device that would help humans and dolphins create a shared communication system? Like the artificial language systems and symbol boards that scientists use to communicate with Kanzi the bonobo or Koko the gorilla, juiced up by cutting-edge technology? As it turns out, that’s exactly the kind of device that Starner and Herzing are working on. Their Cetacean Hearing and Telemetry project is developing a wearable computer that can be deployed by researchers while swimming with wild dolphins. 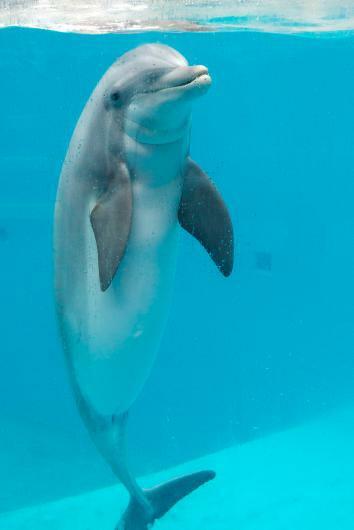 The device will produce artificial whistles that will function as labels for objects and concepts, and record the dolphins’ vocalizations to see if they are mimicking these novel labels. Herzing has provided details about this device at TED, and her overview of the technology is every bit as eye-catching as the trendiest ad for Google Glass that you can find. If I had to put my money on a non-Google based team to break through the longstanding two-way communication barrier with dolphins, it would be Herzing and Starner. Seriously, people: a wearable underwater computer that can process dolphin vocalizations in real time, display the location of the sound source in a heads-up display, and transmit information to the user via bone conduction. Even Disney, which patented its very own two-way dolphin communication device back in the ‘90s, couldn’t come up with something this cool. With one of those strapped to your head, who needs cybernetic dolphins?